In science, you can’t create something in an instant. There is a specific process or a fixed sequence of steps in order to build or create something. This also applies in our world today especially in the field of construction. Tall structures like large buildings and towers aren’t built in a single week or month. It takes a huge amount of effort and time in order to build one. When these kinds of structures are being constructed, the need for temporary cranes arises, as they are really a great help in speeding up the building process. So this week’s subject points to the primary purpose of cranes and as well as the obstruction lights used for them. We will briefly discuss the need of obstruction lights for cranes and as well as the specific type of obstruction lights used for them. A crane is a type of machine that uses one or more simple machines to create mechanical advantage and move heavy loads. It is mainly used for lifting and lowering construction materials and transporting them from one place to another. Construction of large infrastructures and buildings requires a lot of materials to be used, and most of them are so heavy that transporting them from one place to another requires a lot of time. In this case, the use of cranes speed up the transporting and lifting process in which manpower alone would not suffice. Tower cranes is one of the type of cranes that offer the best combination of height and lifting capacity and are mainly used in the construction of tall buildings. As with any tall structure, the presence of a single or a number of cranes has the potential to cause accident and be an air navigation obstacle. As a solution to this potential danger, cranes are installed with obstruction lights for increased conspicuity especially for night time operations. Tower cranes with a height of less than 150m may require obstruction lighting only if they are considered a significant navigational hazard. However, if a tower crane’s height is 150m or more and is not near with an aerodrome, CAA (Civil Aviation Authority) requires the use of obstruction lights. Medium Intensity Steady Red Lights (for cranes with a height of 150m and above) – This type of obstruction light is usually mounted or positioned as close as possible on the top of the crane at an intermediate level not exceeding 52 meters, and has a luminous intensity of 2000 candela. These obstruction lights are lit at night (Night is defined for civil aviation purposes as the time from half an hour after sunset until half an hour before sunrise). Medium Intensity Steady Red Lights (for cranes between 90m to 150m high) – Cranes that are between 90 meters and 150 meters high are also equipped with medium intensity steady red lights that are positioned at the highest point and both ends of the crane jib. The lighting will be an indication of the crane’s height and as well as the radius of the crane jib. These obstruction lights are also displayed at night and are positioned to a place where it can be visible from all directions. Low Intensity Steady Red Lights– Cranes that are 60 meters to 90 meters high are installed with low intensity steady red lights with a minimum luminous intensity of 32 candelas. They are positioned as close as possible to the highest point. And for tower cranes, they are positioned to the top of the fixed structure so that when displayed especially at night, it will be visible from all directions. 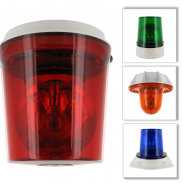 These obstruction lights are typically xenon based lamps because of its outstanding brightness which are very suitable for increased conspicuity at night compared to the other types of lamps. But there are some who prefer using LED to reduce power consumption and ensure longer operating life which reduces maintenance cost. Cranes are one of the most essential things in the field of construction today. Imagine how long would it take for a building to be finished without this. Without the help of cranes, perhaps it may take several years and unexpected accidents may also happen. And to conclude, it seems this type of machine is truly a masterpiece.